I've been in the south of France for the last few days where we're lucky to have a fantastic fruit and veg shop down the road. The most impressive bit is the salad section which generally has 5 or 6 different kinds of lettuces - all local and really fresh. This particular one cost 70 cents - 62p at the current rate of exchange - and is easily enough for a green salad for six. At home it would cost twice that to buy a bag of mixed leaves for two. 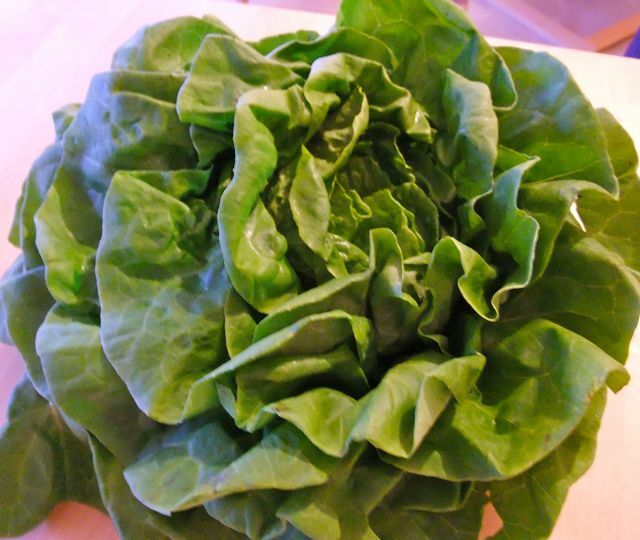 It's really easy to get into the bagged leaves habit but how long does it take to wash and dry a lettuce? Three minutes, if that? If the French can spare the time why can't we? I'm beginning to realise I have a bit of an obsession with cauliflower. It wasn't that long ago I was blogging about cauliflower cheese and here I am at it again. 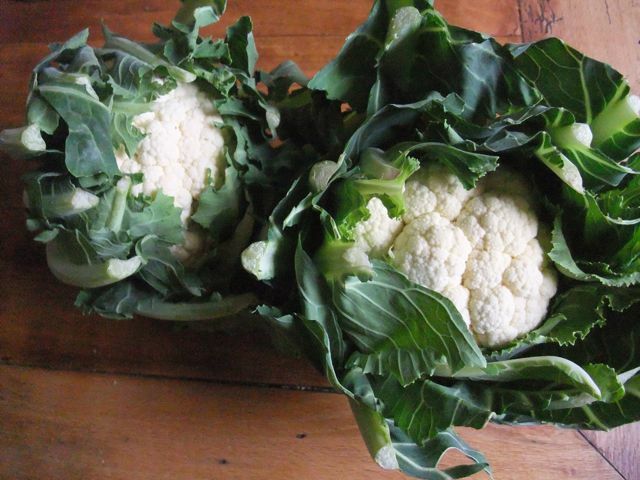 The reason was a bargain from Bath Farmers' market - two small, but very fresh cauliflowers for £1.20. I originally thought I'd be really showy and cook them three ways - one roasted, one puréed, Heston-style and a stir-fry from the leaves but in the end I ran out of time and just did roasted cauli and leaves. Although we had it as a side it was a fairly substantial one and would make a main course dish in its own right. I fancy it with felafel if you wanted to keep it veggie but it could also take a bit of finely chopped anchovy and capers like this version here. I served it hot but you could serve it lukewarm or cold. My husband who, as I've remarked before, is not big on vegetables, actually asked if we could have it again . . .
Preheat the oven to 200°C/Gas 6. Divide the cauliflower into largeish florets, saving the leaves. Put in a roasting tin with the oil and cook for 15 minutes, turning the florets over half way through. Just before you think it will be ready add the chopped garlic and crushed coriander seeds and chilli flakes if using, mix in and return to the oven for 5-7 minutes or so. Remove from the oven, stir in the parsley or coriander and season with black pepper and a good squeeze of lemon. 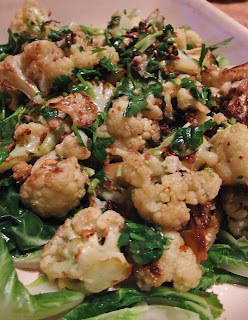 Arrange the leaves on a warm serving dish and spoon over the cauliflower. I was reminded this week just how easy it is to make something delicious out of leftovers - and also how easy it is to forget the fundamental principle which is to do something with them while they’re still hot - or at least warm. I cooked it with onions and diced bacon and a fair amount of wine (I also write about wine so am inundated in the stuff: you could equally well use a mixture of stock and beer or cider) and added roasted carrots at the end to keep their colour. Then I served it with buttered cabbage and mash. I guess there was just about enough meat for two portions at the end of the meal but as it had been slow cooked it would have ended up dry if I’d simply wrapped it in foil. So I chopped it, and the carrots, as small as I could, mixed them with the remaining gravy of which there wasn’t a lot but enough to moisten the meat and put it in a pie dish. 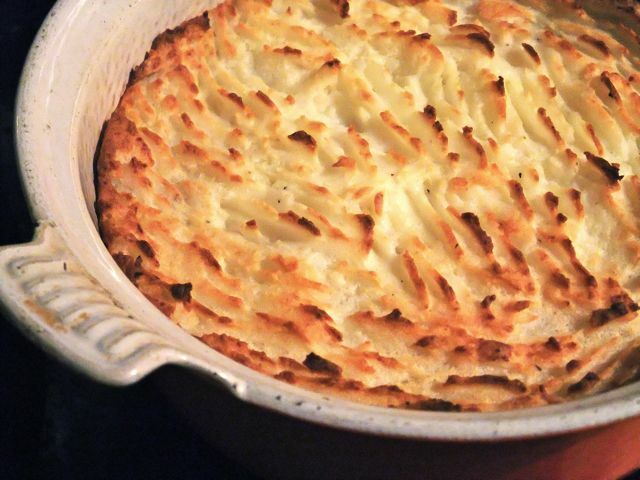 Then I covered it with a layer of cabbage and the remaining mash. One cottage pie with five minutes effort and nothing to do the next day. It turned out pretty well - more than enough for two although we managed to make short work of it. I liked the texture of the chopped meat as a change from mince - I think the only change I’d have made would have been to mix the greens with the mash for a bubble and squeak topping. It’s not so much that I couldn’t have made this the following night (though I don’t think it would have been as good) it’s just that it would have been less appealing - leftovers to be dealt with rather than a meal that simply needed reheating. That's the way leftovers tend to lurk in the fridge until you give up on them and throw them away. The same applies to other kinds of leftover food. If you want to make something of it it’s generally better to do it straightaway. 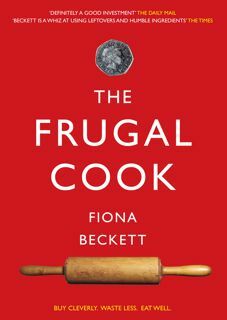 Like dressing pasta, rice, beans or potatoes for a salad, making fish cakes or turning pasta into a bake, with, say, some leftover roast peppers or courgettes if you have some. Or stripping the remaining meat from a chicken and adding it (and maybe some ham and/or mushrooms) to a creamy sauce which can then be used as a pie filling. You can of course freeze it too if you do it quickly. What are your favourite ways of dealing with cooked leftovers? Too busy to blog this week so here's a nice little recipe I rustled up for the Guardian student cookbook I put together last year. 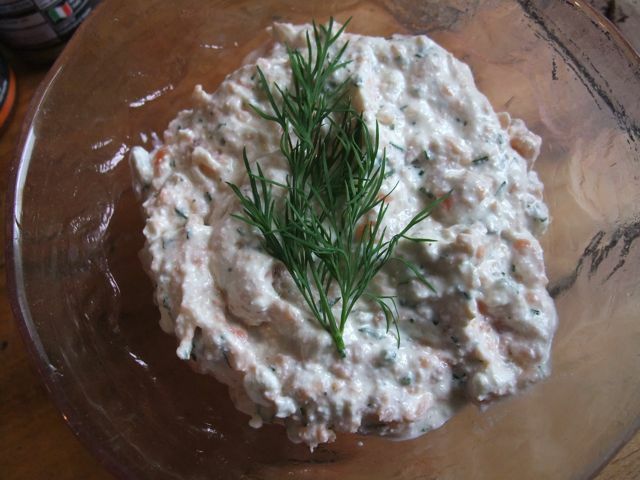 It was made with Sainsbuy's Basics smoked salmon offcuts which are ridiculously cheap and with cottage cheese a product I confess I loathe with a passion but which adds a lovely moussey lightness to this Scandi-style spread. Chop the smoked salmon up small if necessary (with some packs you won’t have to), removing any tougher pieces and put in a bowl. Grate the rind from the lemon and set aside. Squeeze the lemon juice and spoon about a tablespoon over the salmon. Drain and sieve the cottage cheese or whizz it in a food processor to break up the curds. Mix it with the salmon along with the crème fraiche, a little of the lemon rind, chopped dill, chives or capers and plenty of black pepper. Chill for at least an hour and stir again before you serve it. Really good with thinly sliced rye bread or crispbread or as a baked potato topping. So how do you feel about cottage cheese? Love it? Hate it? If it's the former what do you do with it?